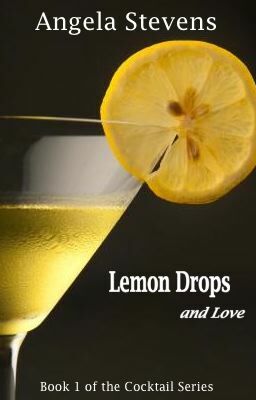 With Lemon Drops And Love's anniversary coming up at the end of May I have been busy working to get the next book in the series up and ready for publication. At last I uploaded all my files and Ice Cold Mint Juleps is up and ready for pre-order. As usual I was having some last minute panics. One of which was that I couldn't find my art work for the Mint Julep cover. Somehow the Gremlins had got in and eaten it, or hidden it, or maybe one of them were sitting on it! Who knows but I didn't find it and had to start all over again. However, what I did find was a whole host of developing cover designs that I have used for Lemon Drops and Love since I wrote the book two and a half years ago. Oh boy now that was a trip down memory lane! But it got me thinking about how nice it would be to share the development of the Lemon Drops And Love cover story with you guys. Some of the following never got to see the light of day and some are a throw back to the stories wattpad days. Now I have always produced my own covers but back in the day, I really didn't have a clue how to go about this and neither did I have any skills in the programs I needed to use in order to create a cover. The first couple of designs I resorted to using Microsoft Powerpoint! These two cover designs date way back to April 2013. The first never made it any further than my computer (Can't think why!) But the second actually was the first cover I used on wattpad when I first uploaded my story there in April 2013. I didn't get many reads at the start- looking back at the cover I think I can see why! By these designs I had graduated first to i-piccy and then on to Sketchbook Pro. At least now I could actually begin to design something rather than just spew some text and images onto the page. When it came time to publish I wanted to get the look of the series just right and I needed to find a direction that I could repeat for all the cocktail books. And this was not it... Neither was this... And NO! But of course that is not the end of the story. With book two on the horizon, I never could get my head around an image that would fit in with the concept for book 2- Ice Cold Mint Juleps. The more I tried to follow the concept, the worse it became. In the end, I decided that a totally new direction was needed. One that would show a little more insight into the story. By this time, I had learned a new skill. PHOTOSHOP! And it was time to test it out and have some fun designing and playing around with the concept. This time, I was determined to incorporate all the books cohesively in the series. Here are some of the variations that got thrown around. These are all concept covers complete with photograph water marks while I experimented. And that then led us to the brand new cover design that has just gone live on the ebook on Amazon, and is about to be launched on Createspace for the paperback copy. So here it is. The Cover Story has ended - for now. I have been really pleased at how this has turned out. The final version of Ice Cold Mint Juleps can be seen on it's book home page. Book 3 - Dark And Stormy, which is due out in the Fall, has still to be finalized, but the concept is on it's way. But wait those of you with eagle eyes will be yelling at me THERES A FOURTH BOOK! Oh Yeah, so there is. Well watch this space, for an announcement about a companion novella called Champagne Moments in the next few weeks. The Complete works of Angela Stevens.